Hmmm. I wonder if I waited too long to dig these out? Oh well. Such is life! I was browsing through some of our photos from our last trip to Italy. I am going to have to get the hang of taking these self portraits like the kids do. They are so good at it. If I am not mindful, I will return with lots of photos of historical and artistic grandeur but not a trace of our own personal journey. We may have to enlist the help of complete strangers. Now that's a novel idea! Final preparations begin. I feel very calm, not all like I usually am before a trip. Maybe because I have only myself to attend to. This will be our first journey without the kids. Alex was over for dinner last evening and getting a touch melancholy about her semester in Italy. We will miss them AND it is time for a adventure on our own. to the crimes of art? I plan to get my fill of both! What if, Kathleen, you're already doing everything right, even though you're not sure? And the surprises along the way have only sped things up, even though it felt like they slowed you down? And all that you want is now barreling towards you, even though you can't see it? And when it arrives it'll exceed your every expectation, even though your dreams were huge? Wouldn't you be making some really weird noises about now? Whoohoo'ing, howling... maybe even whoohoo-howl-barking? More dreams of Italy with hidden gratitude statements creating an energetic and "magnetic" foundation. If I have time to day dream, I might as well use all of that power in the direction of experiences I would like to manifest. It sure can't hurt and it's fun! The next morning my husband returned from his usual run to Starbucks and found my daughter's back window broken and her back pack gone. (#2) Victoria was quite upset. All of her AP books and notes, and most importantly, some new lip gloss were in that backpack. And let's not forget her homework. This little, though costly, obstacle had a happy ending. We were at the football game on Saturday when Tori received a message via Facebook. The villains didn't seem to think her very expensive school books were worth it and dumped the backpack in someone's yard. The good Samaritans used this crazy networking system to find Tori and reunited her with her books later that evening. But not the lip gloss. It must have been the culprit's favorite color. Tuesday morning I was locked in our guest room with our dog, Rockne, safely under the covers (so he sees nothing, hears nothing and therefore does not bark incessantly) while broadcasting the live radio show I do with my friend Jill. As the show ended and I opened the door, Rockne made a mad dash down the stairs in one of those "frenzies" only a dog lover can understand. Seems a squirrel had gotten into the house. (#3) I got Rockne into his cage and tried to make an easy exit for the squirrel, ala' a gourmet trail of walnuts and an open deck door but said squirrel decided an exploration of the upstairs seemed much more exciting. I corralled him in my son's room and called the "critter control" people who happened to be in our neighborhood at the time. Can you imagine what would have happened if he had gotten into the house while we were gone for 3-4 days? Yikes!!! Tonight is "Meet the Faculty" night at our high school. I plan to be all packed for tomorrow's trek to South Bend before I go. This evening is all about me and relaxing with a bottle (yes I said "bottle", not glass) of wine when I return home. Bigger sigh. I usually look for all sorts of reasons and signs and messages from weeks like this. It's funny, but my mind has not "gone there" over this past week. We have had some obstacles, nothing earth shattering, and we dealt with them as graciously as possible. End of story. And one must stay focused on the present if one is going to be cleaning up over-flowing toilets, catching wily squirrels and reclaiming wallets and backpacks. No need for practicing at all. Here's hoping everyone's weekend is as joyous as possible. And yes, here's hoping for ANOTHER Irish victory! I have been looking through some of our photos from out trip to Italy 18 months ago. Alex spent a semester there her senior year and we visited for Spring Break. We had such a fabulous time and 'what happened in Italy, stays in Italy' is one of our favorite private jokes. I had planned to put a book together with our photos and memories. I have a huge plastic container with tons of ephemera I collected each step of the way. I must get to that soon. Or should I work on the mementos I brought back from Greece first? That was in 2002. Where does the time go? I love Greece. That may not surprise you with my jabbering and gushing over all things ancient and old. You can't get much older than Greece. At least not in Western civilization (if we can call it that some days). I traveled to Greece on a pilgrimage in 2002. I went alone, but with a group. We explored many of the ruins consecrated to the Sacred Feminine, the Goddess. At the same time we delved deeply into the study of archetypes. Our personal archetypes to be exact. It was a trip of a lifetime. My first time away from my family and on an adventure I had dreamed and read about for years. I could hardly believe my good fortune. Now, many years later, I remember it as if it were yesterday. And many days it seems but a dream, perhaps a story I read or pictures I have seen that I somehow confused with my own experience, my own life. To be in such an ancient place while doing deep and personal inner excavations at once seem mystical and ordinary. Walking the stones Socrates stood upon as he proclaimed "An unexamined life is a life not worth living", or sitting alone at dusk in Delphi's temple of Athena Pronaia as the Oracles' command to "Know Thyself" rang through my ears, I felt I had been there before. Lived there before. Perhaps in another lifetime or only in my dreams. For the first time in my life I felt I had come home. Not to Greece necessarily, although I did leave a portion of my heart behind in her magical hills. I had come home to myself. For the first time I felt I was totally and most completely in my own body, the steward of my own life. Charting a path that needed to make sense only to me. 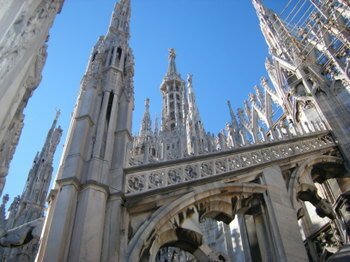 My daughter Alex was fortunate enough to be afforded the opportunity to study in Milan this past semester. While there were many bumps in the road for her as she maneuvered a new continent, a new culture, a new country and a new language, my husband, our youngest daughter and myself had the perfect excuse to visit and spend two weeks in Italy this past spring. A doctor's receptionist recently posed the question "Where would you go if I gave you a ticket to anywhere in the world?" My answer: "Back to Italy!" Back to Venice with her watery passage ways, crowed with tourist and vendors. Her darkened labyrinths intoxicated with mystery and whispered dangers of a long ago time. Who stepped on these very stones so many centuries ago? Perhaps Marco Polo before he began his travels in China. Or Galileo while teaching mathematics and shaking up the world and the Church with his heretical astronomy discoveries. Or possibly the Doges and their Courtesans as they regaled themselves with finery and indulged in any pleasure that caught their fickle fancy. I could wander these magical mazes for months, drunk on the sights and smells of this glorious city as I visit magnificent Church after magnificent Church. Museum after museum. Palazzo after palazzo. Enchanted with the earthy smells of water and mold woven like a faded tapestry amidst the heady aromas of spicy delicacies enticing enough to bring out the lascivious nature in the most mild mannered of traveler. 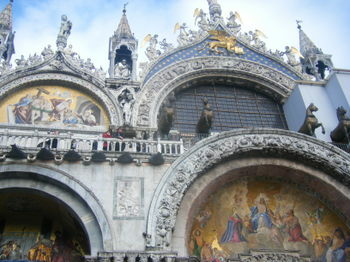 Ahh, Venice! Ahh, Italy! My return can not be soon enough.